Seeing off the last summer month, I want to say that I enjoyed the weather: it was slightly warmer than our last couple of cold summers but still not scorching hot – which was just perfect for our ongoing drought. What was unusual for this summer was an unexpected high humidity. It was a long-forgotten feeling of the sticky warm air right before the storm. With the only difference that storm had never come: we don’t get rains in summer. Though I’ve heard there was drizzle in some areas. Despite (or maybe because of?) mild temperatures AC in the office was adamant to keep us cold and I was blaming the persistent cough I had for almost a month on that – until I re-read my statistics post from two years ago, in which I mentioned having persistent cough that August. Now I need to investigate what allergens might be responsible for that in our area. I don’t know how entertaining these posts are for you but they proved to be very useful for me. For this month’s statistics post I asked my readers here and random participants on Facebook Fragrance Friends group a theoretical question – To Wear or Not to Wear? The rules of engagement were: provided you could take on a three-month trip and use just one perfume from your collection that you once liked but do not wear any more, would you do that or rather not wear any perfume at all during that period? The results were interesting: first of all, I got almost the same number of responses to the poll here (20, including my vote) and on FB post (21 votes – out of 5K members in that group). The next curious observation: votes split very differently in these two groups. 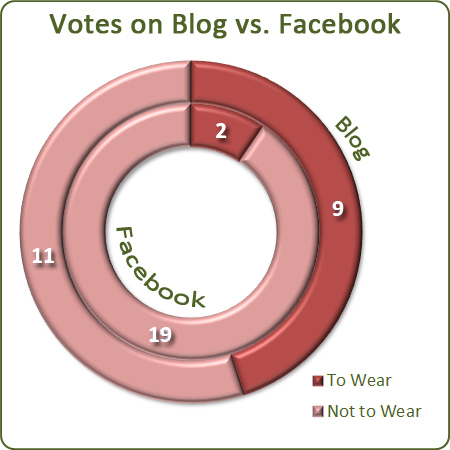 While commenters in my blog divided almost evenly – 55% (11 votes) chose “Not to Wear” vs 45% (9 votes) voted “To Wear”; respondents in the FB group were more uncompromising – more than 90% (19 votes) chose not to wear anything rather than going for an old flame. I wonder what the roots of such discrepancy are. How did I vote? Every time when I have to create a list or answer one of these questions, I take it very seriously – as if somebody will hold me to the answer. So I went through my perfume database “trying on” each of the perfumes (I looked only at bottles). If not to take into account those that turned and stay in my collection for the bottle or sentimental reasons, there is not a single perfume that I dislike. Some of them wouldn’t be my first choice but still I would gladly wear any of them before I skip perfume altogether since it’s a vital part of my day-to-day life. Though, I must admit, as Sabina said in her comment, it would be difficult for me to wear just one perfume for three months even if I loved it. So I hope not to find myself in this type of situation. Ever. ← To Wear or Not to Wear? Great statistics summary and how interesting to see that the responses are so diverse comparing blog comments and FFF input. I’m glad that other people think similar to me, that it’s better to go unscented rather than wear the not-loved-anymore perfume for 3 months in a row. I was surprised the difference was that significant. Interesting the different levels of engagement between blog and FB group. I like to think that if I return to a previously loved fragrance that I can remind myself of why I liked it and can still appreciate it. Your stats posts are entertaining, I love me some analysis. It’s nice to learn how useful these posts have been for you as well as entertaining for us. I guess it might be pretty difficult to track down the cause of your August cough but I hope you find it. So as per your question, if your only choice was a perfume you actually disliked would you go without? I definitely won’t be able to wear a perfume I actively dislike. I use these stats posts to track weather as well – so I can always look up what I thought about that month’s conditions – temperature, rain, etc. Does that mean the cough goes in September? I hope :-) It is better already so I hope it goes away completely. I didn’t want to give my answers in the initial post because sometimes I feel like I’m steering the results by providing my thoughts on the topic. I have long periods of time when I don’t feel like wearing some of my perfumes (like ambers last winter) but if I had to choose between not wearing anything at all or wearing those “wrong at the time” perfumes, I’d go for latter. Interesting that you don’t have any perfumes you don’t love enough to wear. I’d agree that there is nothing I wore in the past that I couldn’t happily wear for three months-provided- the formula was the same! I’m a faithful person but object to perfume identity theft. “perfume identity theft” – it’s a great way to put it. As to the perfumes in my collection: I’m very consistent with my “likes” and “dislikes” and I’m not too impulsive with purchases. Suzanne has hit the spot with her comment about your careful choice of perfume in the first place. I have made some terrible FB choices in the past, but none of them repulse me, I don’t think, so I would still persist in using the lapsed scent for the duration, in the spirit of celebrating perfume as a concept as much as anything. Sorry about your annual cough – I hate AC with a vengeance and when making discreet inquiries about a full-time post I might be applying for, I actually asked someone who works at the company already what the AC situation is like in summer! I do not mind AC per se but I wish it kept the temperature in more comfortable zone. I have no regrets about any of my bottles – I enjoyed them all at one time or the other – but I wish some of them were smaller. Boo hiss to Facebook. The big difference in responses between the two groups IS interesting. I’m not surprised by the variance in the answers… to me there are various groups of perfume lovers in our world, the bloggers, the FB groups and the video reviewers. All of them have a different approach to perfume and their love of it. I think there is some crossover between the groups, but not a lot. That’s true: the groups are different. Probably that’s why there are many followers there who usually don’t read blogs but spend time on FB. I, for example, never watch any youtube reviews but participate in some FB groups (not too much though). I also imagine there are differences between these groups. Probably the people that take time to seek out blogs, read posts all the way through and bother to write a comment are more “into” perfume than many of the FB users, who are content to get their perfume-fix passively served in a feed. At least, that’s my theory for explaining the discrepancy. It’s a sociological study that I have always thought would be fascinating. However, I have the feeling that any findings based on a study, no matter how un or how scientific would ruffle some feathers (I have my own opinions), but I do think you’re right with your observation above…it’s instant, supported by others (likes) and highlighted by possession. I agree with you. For me I just confirmed where to direct my efforts. All those groups are just too … impersonal (?) for what I want from the online communications.